This is an exciting month for millions of new graduates. Here are some of our favorite graduation quotes, words that might inspire an entire graduation speech ... and fill an entire graduation card! (And of course you can choose a background design and color and have any or all of these printed for framing at QuotePalettes.com!) 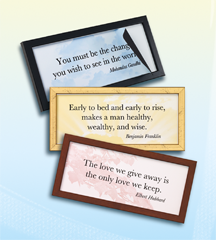 Enjoy our quote selection, and congratulations and best wishes to all graduates and their proud families!